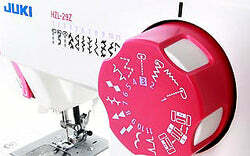 Juki HZL-29Z Mechanical Sewing Machine. Besides its very contemporary design, the 29Z is easy to use. The functions are very intuitive. 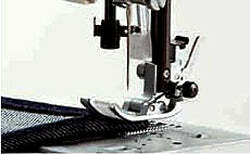 From its Automatic Needle Threading to the Easy Sewing Start feature, a 29Z is a delight to operate. Once you own it, the word you will use most often to describe it is “Easy”. You want results? This lightweight and handy machine can deliver. 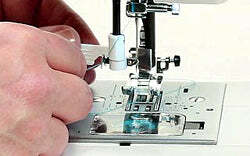 Easy Stitch Selector, easy Reverse Feed Lever, easy Drop-in Bobbin, easy 4-step Buttonholing are a few of its traits. 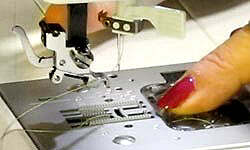 Juki modern sewing machines are making the setup process much safer and faster. Simply push down on the Threading Lever then turn it forward and back. The feature pushes the thread through the needle eye and leaves a loop for you to pull away. Snap on, close the button tray to set the buttonhole size, and sew this way. Step 1 - Sew 4 or 5 bartack stitches. Step 2 - sew forward to the end of the buttonhole length. Step 3 - sew 4 or 5 bartack stitches. Step 4 sew backwards to the beginning of the buttonhole mark. Place the wound bobbin in the bobbin area, follow the simple thread path and close with transparent bobbin cover. The cover allows you to see the amount of bobbin thread available. The accessory box neatly stores accessories, tools and bobbins. When Free Arm Sewing is desired, simply slide off the box. Easy Multiple Layer Sewing Start. Push the black button located at the base of the Presser Foot to lock the foot in a parallel position relative to the throat plate in order to start sewing multiple layers of fabric or overlapped material. The button will release after a few stitches. 22 Stitch Patterns and Changeable Needle Positions available with the turn of a Dial. Zigzag width can be adjusted by turning the stitch Selector Dial. Select either the left or the center needle position for straight stitches. Stitch Width: Max. 6.5 mm. Presser Foot Lift: 2-step Max. 9.5 mm. 198 mm (7.795 inch) deep. Weight: 5.9 Kg (13 Lb).